Anyone paying a moderate amount of attention has probably noticed a smidge of infighting in the Ketogenic community over something you wouldn’t think should be a source of controversy: fat. Plate fat, fat bombs, and fatty coffees are frequent targets of ire and consternation, and some folks can be fairly abrasive in their denouncements of those who eat on the higher end of the fat scale. We here at Ketovangelist are not, by any objective measure, fat-phobic. We love our fatty foods, and we aren’t in the business of shaming folks for enjoying fatty coffees or fat bombs. At the same time, you won’t usually see our coaches pushing them, either. Speaking very generally, there isn’t anything inherently wrong with having some butter or mct oil blended into your coffee or eating so-called fat bombs, and we disagree with the demonization of dietary fat. When we cut carbs down to 20 grams a day and eat moderate amounts of protein….well, that’s not a lot of calories consumed between just those two macronutrients. Unless you’re starving yourself (don’t do that), the rest of your calories have to come from somewhere. That somewhere is, by default, dietary fat. However, the fat-skeptical camp does have a broader point that is valid that I’d like to address today. That point is that no one should constantly rely on drinks and treats to meet their energy needs, and that shunning actual meals in favor of fat bombs and fatty beverages is problematic, long-term. I’m a coach. I’ve lost over 80 pounds, untold inches, and went from wearing a women’s plus sized 20 to a petite size 2/4. I’ve also maintained for another two years, so I’m a keto success story. I’m here to tell you that I have personally had fatty coffees and fat bombs, and most of that consumption was during my weight loss phase. But what I can also tell you is that I did not rely on those things on an every day basis in order to “meet my macros” or get in enough energy to sustain my activity, and that is where I think there can be a disconnect between what the Ketogenic community as a whole is trying to teach and what the average layperson takes away from it; this disconnect is largely what fuels the internecine squabbles between those who deride plate fat and those who don’t. Today, I want to take a minute to actually show y’all what a Ketogenic plate typically looks like. I will include photos of my meals from yesterday, but keep in mind this is how I eat on most days and at most meals. I want everyone to understand that this is how most of us should be eating, the vast majority of the time. A Ketogenic plate is, at most meals, going to consist of a fatty meat accompanied with a fatty topping or sauce, and a friendly vegetable which may also be accompanied by or cooked in fat. 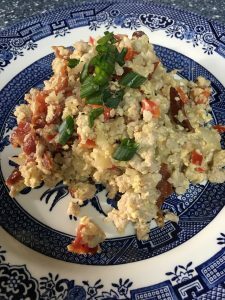 Sometimes these elements are combined into one-pot dishes, like you will see in my breakfast and lunch below, and that’s fine. In my coaching travels, I’ve come across a substantial number of people who are under the impression, mostly mistakenly, that to “do” a Ketogenic protocol one must spend all day sipping on coffee loaded with butter, heavy cream or coconut milk, coconut oil, mct oil or powder, raw eggs, collagen powder, and (oddly enough) sometimes cream cheese. I’m here to tell you that there is nothing magical about this “witch’s brew,” as my friend and fellow, Coach Linda, calls it, and you’re not going to start dropping massive amounts of weight overnight by sucking multiple cups of the concoction down every day. In fact, unless you’re on the go and just need something quick and portable, or are fueling for a marathon, I encourage everyone to eat an actual breakfast in the morning. The reality here is that you’re going to get a lot more in the way of actual nutrition (vitamins and minerals) from a plate of bacon and eggs cooked in butter and/or bacon grease than you will a coffee loaded with fat. This is my breakfast from yesterday. 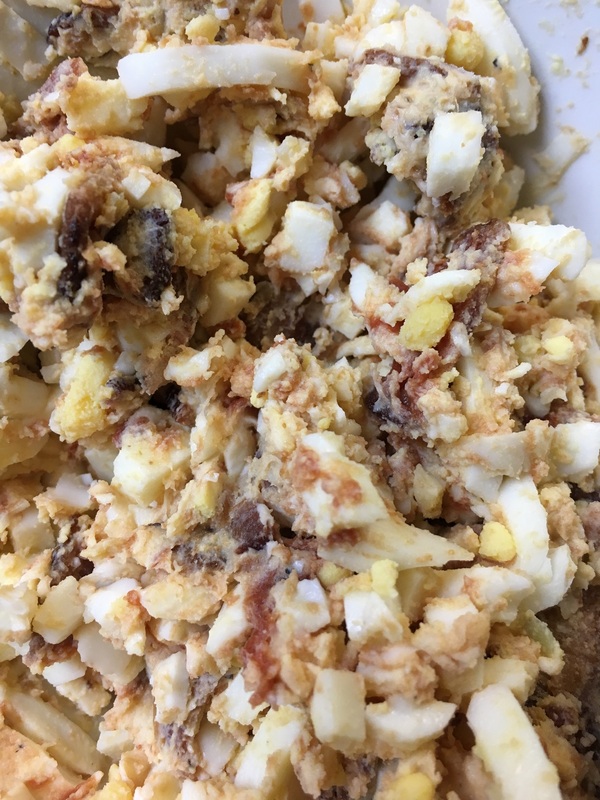 It’s a generous helping of Bacon & Egg salad (recipe found in Kickass Keto). You’ll notice it’s two breakfast staples- bacon and eggs- and some fat as a binder. In this case it’s butter and heavy cream as the fat source, but you could easily use avocado oil mayonnaise to bind and up fat content. I also had two cups of coffee with one tablespoon each of heavy cream. This is a real Ketogenic meal. I also frequently see people using fat bombs later in the day as a way to “get in” enough in the way of calories. Experience has shown that when I look deeper into what someone who does this is typically eating, the reason behind a person regularly falling short and resorting to fat bombs to make up the difference is usually because he or she spends all day eating snacks and finger foods (which tend to quickly boost protein without much added in fat) instead of normal meals. Don’t get me wrong, I like a pack of almonds, pork rinds, or some salami and cheese as much as the next person, but I’m not eating those things every single day. In fact, when it comes to nutrient content, if you’re constantly relying on snack foods instead of a well-formulated meal you’re not eating as healthily, or as ketogenically, as you could and should. Here is what my lunch plate yesterday looked like. 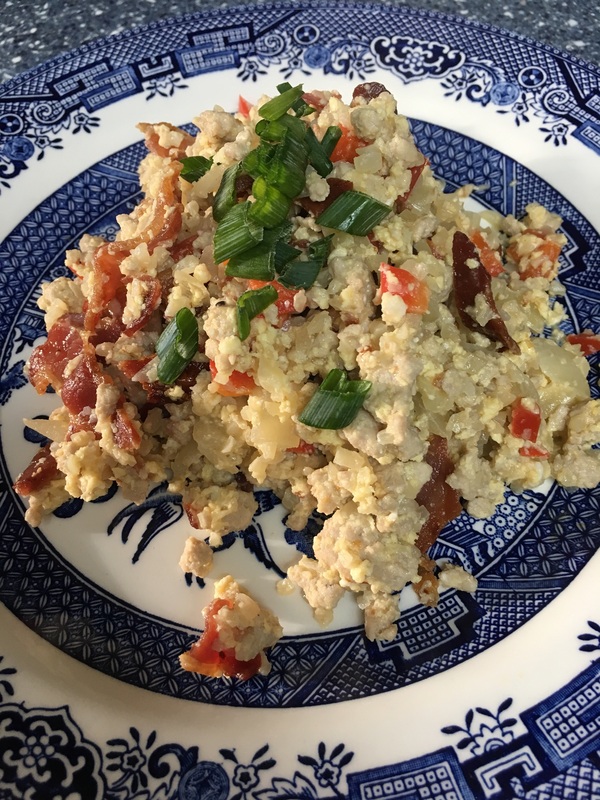 This stir-fried dish contains ground pork, bacon, onion, riced cauliflower, and some fat in the form of cream cheese and heavy cream. I cooked the whole thing in avocado oil. If you need more fat on your plate, add butter or oil drizzles, or maybe even some olives or avocado slices, but notice that this is a meal and not a plate of snack or finger foods. My dinners are similar in composition. Last night’s plate consisted of four ounces of ribeye steak that my fabulous husband cooked sous vide, then pan fried in bacon grease and butter to get that gorgeous sear. I topped that sucker with a full tablespoon of butter. My side is a celery and cucumber salad, tossed with avocado oil and fresh chopped herbs to dress. 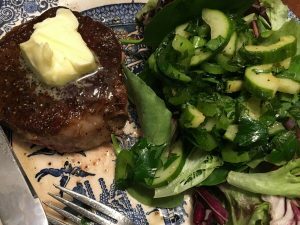 This was a simple, delicious, nutrient dense, and high fat meal. Notice what’s missing in all of my meals? No coffee concoctions. No fat bombs. No finger foods at all. When I eat, I sit down and have a full meal, and I eat real, nutrient dense, Ketogenic foods. I’m going to repeat that we here are never in the business of shaming anyone who has a fat bomb or a fatty snack or coffee. Sometimes, I have those, too! But notice the key word in that sentence: sometimes. The vast majority of the time, I’m eating nutrient dense Ketogenic foods and adding some extra fat on my plate so I can meet my daily caloric needs. That’s all. And folks, I am here to tell you that yes, it really is this simple! Are there insanely awesome recipes out there that mimic everything from Kentucky Derby Cake to deep dish pizza? Yes, there are, and they’re awesome. But there is no Ketogenic law that says you must eat those things all the time. There is no rule that says meals must be super fancy gourmet concoctions, or else you’re stuck eating pepperonis and string cheeses, and sucking down fat bombs and trying to pile a ton of fat into your coffee so you don’t starve. There is no need for all that, at all. Now that you’ve seen a day in the food life of Coach Mandy, I hope you have a better idea of what a Ketogenic plate looks like and how to formulate your own meals. Just eat real food, folks, and keto on.